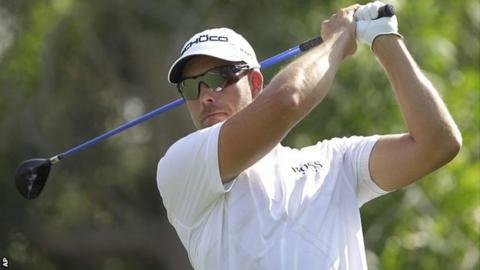 Henrik Stenson stayed on course for the Race to Dubai title by maintaining a one-stroke lead after three rounds of the World Tour Championship in Dubai. The 37-year-old world number three posted a 67 to reach 17 under. Victor Dubuisson had 11 birdies in a 64 to move second, with Ian Poulter four shots off the lead after a 66. Poulter can deny Stenson the Race to Dubai title, while other contenders Justin Rose and Graeme McDowell are six and nine shots adrift respectively. Swede Stenson was not able to repeat the imperious form of his 64 in round two, largely content to play for position at the Greg Norman-designed Earth Course at Jumeirah Golf Estates. But three successive birdies on the back nine kept him in command, and a deft chip to inside two feet from the back of the 18th green edged him ahead of Dubuisson. "I stayed patient and I got the reward in the end," said Stenson, seeking to become the first man to win the European Tour's Race to Dubai and the PGA Tour's FedEx Cup in the same season. "It has been three good rounds up to now and I'm not going to quit now." Dubuisson, who carded 28 birdies in winning his maiden European title at the Turkish Open last week, has already accumulated 24 this week. The 23-year-old Frenchman recovered from a double bogey at the 10th and has a remote chance of winning the Race to Dubai, but would need victory in this tournament and for Stenson to finish outside the top 32. Englishman Poulter can also win the Race to Dubai if he wins the Tour Championship and Stenson finishes outside the top two. The 37-year-old Ryder Cup favourite had two putts that spun out of the cup but found the green at the par-five 18th in two shots to set up an eagle chance which, though the initial putt drifted left, enabled him to card the eighth birdie of his round. Lee Westwood, who has slipped to 23rd in the world rankings, compiled seven birdies in his first 11 holes to move within one of the lead. The 40-year-old, joint-eighth in this year's Masters and joint-third in the Open, put his tee shot in the water at the final hole but salvaged a par for a 65 and is alongside Rose at 11 under, six behind Stenson. Former world number one Luke Donald rolled in a 10-foot downhill putt at the last for his fourth successive birdie and a 67, to finish on 10 under.